A fresh approach to ITIL®: The ITIL Process Map is a 'translation' of ITIL® into legible, easy to read process maps in Microsoft Visio®, ARIS™ and other process management platforms. The process model is officially ITIL® licensed. It explains how ITIL really works and does away with the need to sift through the books with thousands of pages. The ITIL Process Map has been widely accepted with many large - and small - organizations, leveraging our process model to implement ITIL faster and at lower cost, with less reliance on expensive consultants. The ITIL process model is easy to use and understand. It is thus ideally suited to overcome the single most important challenge at the beginning of any ITIL initiative: To give everyone in your organization a good understanding of ITIL. The ITIL process templates are available in popular formats: Simply use the familiar office applications (Microsoft Visio and Excel) to manage your ITIL processes, or your favorite process management platform like ARIS™ or iGrafx®. The process diagrams are fully adaptable. This means you save effort during process design and documentation, as you modify existing process diagrams - rather than starting with a blank page. The ITIL process model, its document templates and the complementary project manual provide guidance on how to set up and carry out your ITIL implementation project. The top-level process diagram presents the ITIL service lifecycle on one single page. Five diagrams on detail level 1 explain the five ITIL service lifecycle stages. A set of 24 overview process templates on level 2 provide insight into the ITIL main processes. On level 3, 126 detailed activity chains show what needs to be done by whom as part of a process. A RACI Matrix illustrates the participation of the ITIL roles in the various ITIL processes. More than 100 checklists and document templates describe process outputs and other aspects of the ITIL processes in more detail. A collection of KPIs supports the definition of ITIL process metrics. Finally, accompanying documents like an ITIL implementation guide help you to get started with ITIL and the ITIL Process Map. 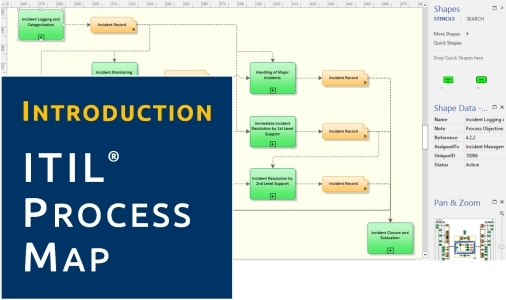 Use cases: Learn how the ITIL Process Map supports typical tasks of your ITIL initiative. FAQs: Answers to common questions about ITIL implementation projects and ITIL reference processes.